Good. 1997. 1st Trade Pbk. Ed. Paperback. Previously read but clean copy......We ship daily from our Bookshop. Very Good. 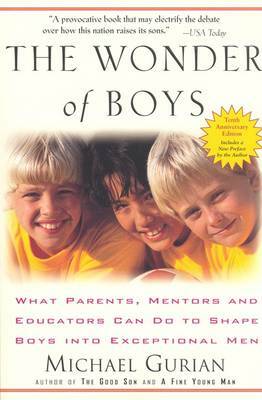 The Wonder of Boys: What Parents, Mentors and Educators Can Do to Shape Boys into Exceptional Men by Gurian, Michael, 2006-09-07. Trade paperback (US). Glued binding. 296 p.
Very Good. The Wonder of Boys: What Parents, Mentors and Educators Can Do to Shape Boys into Exceptional Men by Gurian, Michael, 2000-01-18. Trade paperback (US). Glued binding. 294 p.
Good. The Wonder of Boys: What Parents, Mentors and Educators Can Do to Shape Boys into Exceptional Men by Gurian, Michael, 2000-01-18. Trade paperback (US). Glued binding. 294 p.
Very Good. 0874778875 Ships from Tennessee, usually the same or next day.